Nuts to You is a highly entertaining and wise account of squirrels rushing around the forest, wondering what the humans are doing cutting down trees along the buzz path. When Jed, TsTs, Chai and Tchke figure this out, they are off to warn the others. Unfortunately, most squirrels can’t understand the complicated process, so they turn moving into a Game. 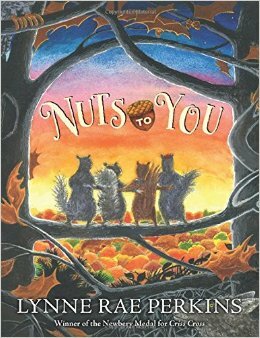 Written and illustrated by Lynn Rae Perkins, Nuts to You is a story within a story that’s fun, environmental and wise. This entry was posted in Books with social studies links, Children's novels, Michigan author/illustrator and tagged animals, middle grade, squirrels. Bookmark the permalink.